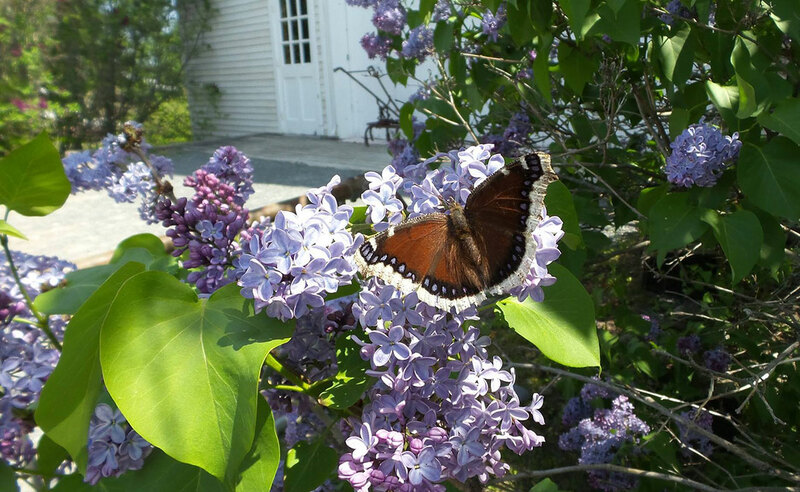 Prune spring-flowering shrubs such as forsythia, weigela, lilac, and spirea after flowering has finished. Pruning Woody Landscape Plants is a great resource to get you started. 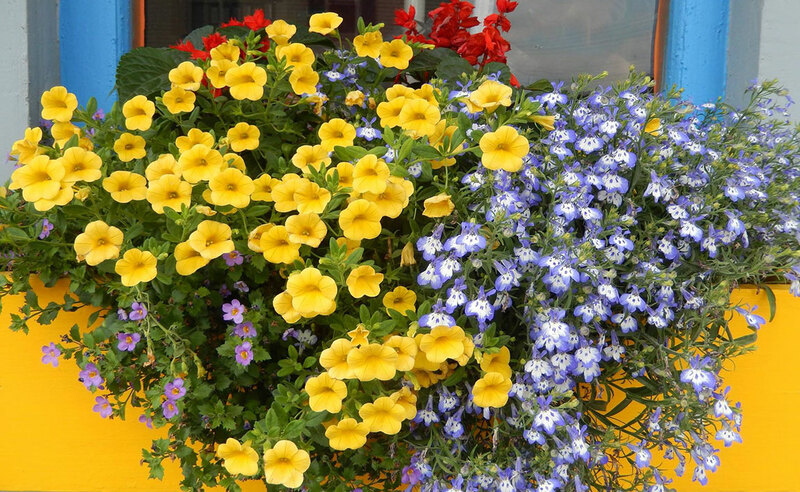 Harden off your half-hardy bedding plants by leaving them outside for the day and bringing them under cover at night. Do this for 7-10 days before planting out into beds, containers, and hanging baskets. 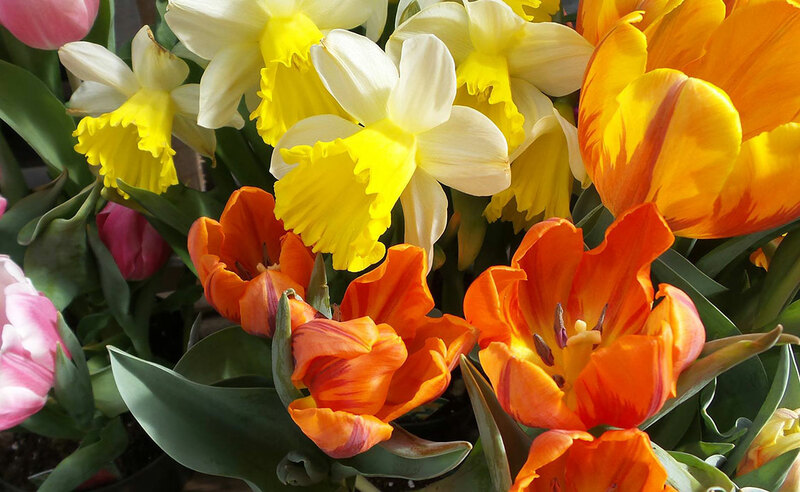 As the ground warms, begin planting summer flowering bulbs such as gladiolus, caladiums, dahlias, cannas, and elephant ears. Place cutworm collars around young vegetable transplants. Collars can be easily made from cardboard strips or small plastic cups. Start planting your vegetable garden, paying attention to soil and air temperatures. 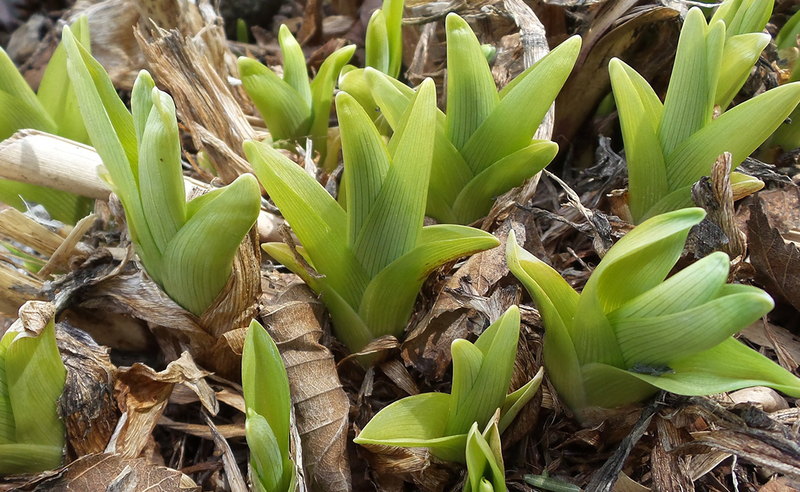 Remember, there is still a chance for frost until late in the month. Vegetable Varieties for Maine will help you select the most reliable varieties for our climate. Keep asparagus harvested for continued spear production. Control asparagus beetles as needed. For information on planting, growing, and harvesting asparagus, refer to Growing Asparagus in Maine. Prune unwanted shoots as they appear on fruit trees. Mulch to your garden beds to conserve moisture and control weeds. Attract insect-eating birds to your garden by providing good nesting habitats. 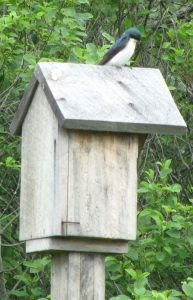 Birdhouse Basics is a great place to start. Leave the dandelions for the bees. 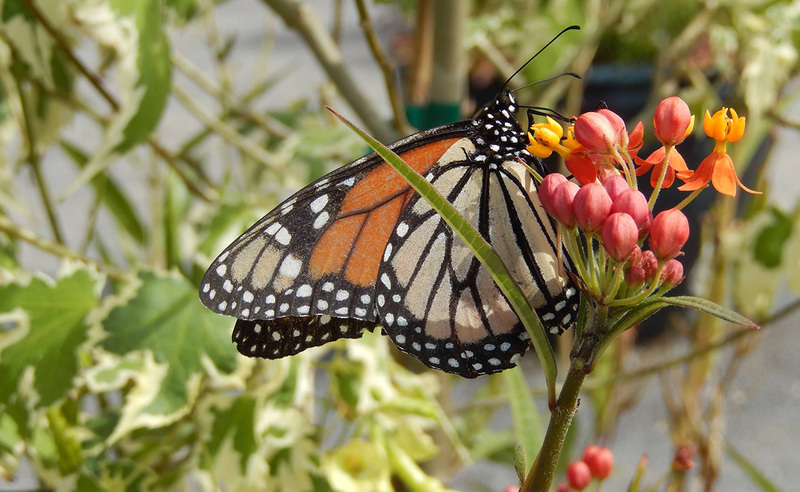 They provide an early source of nectar and pollen. Take steps to control slugs, snails, and aphids now, before they have a chance to reproduce and devastate your garden. Remember Mother’s Day is May 10th. 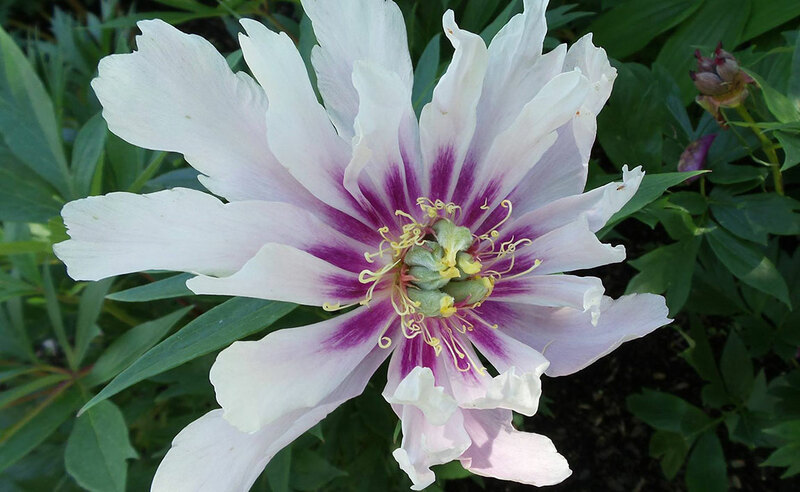 Patronize a local plant sale (several of the Master Gardener programs across the state are hosting plant sales) OR visit a local public garden. 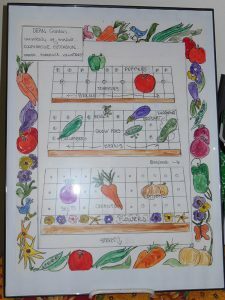 Bring a notebook to jot down ideas and plant combinations for your garden. This has not been an early spring for us in Maine. Cool temperatures and some heavy April rains are keeping many of us out of the garden. 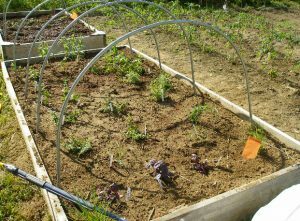 One option to speed things along is to use plastic or fabric covers over supports to create a mini-hoophouse. These are short structures, less than three feet high, which create a warmer microclimate under them. Although these structures require some special management, you might be up for the challenge! You should put a mini-hoophouse in the part of your garden that will produce the best and can be worked in earliest. So, full sun is a necessity, as is good drainage. A slope to the west or south can help, if you have that option. Some protection from the wind can be helpful so the cover is less likely to blow off. These mini-hoophouses consist of three components: a cover to help retain the heat, supports to keep the cover off the vegetation, and weights or clips to keep the cover in place. Clear plastic will provide the greatest heating. Greenhouse-grade plastic will be useable for many years without getting cloudy or brittle. However, it may get too hot under a solid plastic cover on a sunny day. So, you will need a plan for venting the structure in the morning and closing it up again in the late afternoon. If you can find perforated or slitted plastic, that will provide venting automatically. Spun-bonded fabric row covers will raise the temperature less, but will also have fewer problems with overheating. Be sure to look for a medium-weight fabric, not the insect-barrier weight. Remember that the heavier the material, the less light that will get through. Hoops made from bent ½” electrical conduit (EMT). Photo by Caragh Fitzgerald. Bent wire, flexible tubing secured over rebar driven into the ground, or bent electrical conduit (1/2” EMT) are the materials most commonly used for supporting the covers. Some UMaine Extension county offices have pipe benders available to lend out if you are interested in bending your own conduit. The supports in the photographs below are electrical conduit that was bent using one of those pipe benders. The supports need to be pushed at least 8-12 inches deep into the soil so they don’t shift when the wind blows the cover. If you are growing in raised beds, you can attach pipe clamps to the inside of the box, and the electrical conduit or tubing can be slipped into these clamps. Whatever cover you choose, you will need to hold it down, or else it will blow away. Some people bury the edges in the soil, but that makes it time-consuming to lift the cover to vent the structure, or to weed or water. Large rocks can work, as can bags filled with rocks or soil. (Consider purchasing bags that can hold up to the ultraviolet light exposure. Otherwise, you can end up with plastic shreds and bits in your garden.) Other options are boards, lengths of rebar, or plastic pins designed for this purpose. When part of your garden is covered, you might assume that things are going OK under there — out of sight, out of mind. However, you will have to pay extra attention to these areas. Most importantly, be sure the temperatures don’t get too high. You’ll have to work out a schedule for lifting the cover on days that will be sunny or even just brightly overcast. If you are using plastic cover, you will probably need to water underneath. Check it each time you lift the sides. Finally, weeds will still grow, and they will be quite grateful for the warmer temperatures. So, what should you plant in a mini-hoophouse? Warm-season crops such as tomatoes, peppers, and squash are perfect, since they will benefit the most from the higher temperatures. 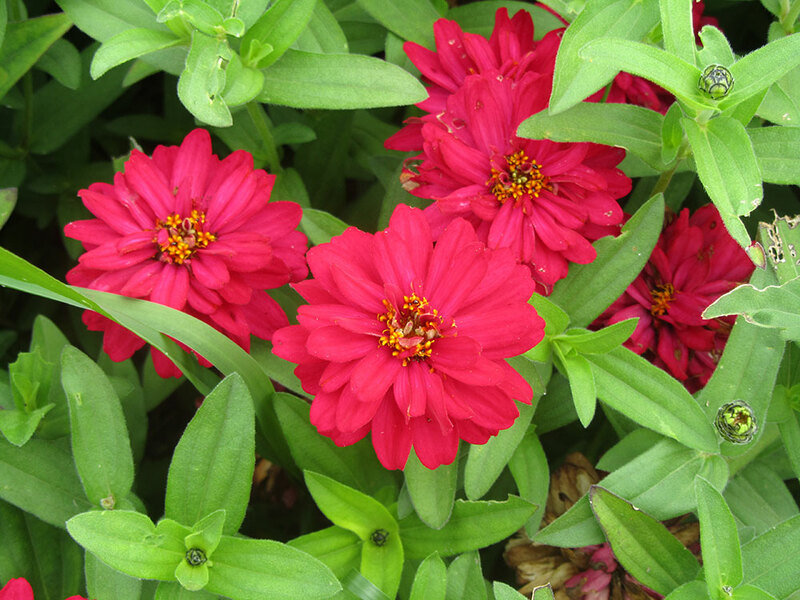 Just be sure to take the covers off when the plants start to flower to ensure pollination. You can use covers over cool-season crops early in the season, too. They do not tolerate high temperatures well, though, so you will need to be more vigilant about venting. A mini-hoophouse might be just the thing for you this cool spring! Spring is here, so it’s time to think about the outdoors and proper protection against ticks. Maine had more than 1,395 cases of Lyme disease reported in 2014, a number that continues to increase yearly. May is Lyme Disease Awareness Month and we want to remind you of the importance of daily tick checks and encourage the “inspect and protect” prevention strategy. Ticks are primarily active in warmer months. Lyme disease is a bacterial infection that is caused by a bite from an infected deer tick (Ixodes scapularis). In Maine, Lyme disease is most common in adults 65 and over and children between the ages of 5 and 15, but anyone can get the disease. Individuals who work or play outside are more likely to be exposed to ticks. The most common and visible symptom of Lyme disease is a red bulls-eye rash that grows and appears within 3-30 days of exposure. Other symptoms may include fevers, and joint or muscle pain. Use caution in tick-infested areas. Use an EPA approved repellent. Perform daily tick checks after any outdoor activity. Deer ticks can transmit not only Lyme disease, but also two other tick-borne infections that are endemic in Maine: anaplasmosis and babesiosis. Cases of both these diseases are on the rise in Maine, as cases of anaplasmosis doubled for the second year in a row and cases of babesiosis increased from 2013. The majority of tick-borne illnesses occur during the summer months when ticks and humans are active outdoors. 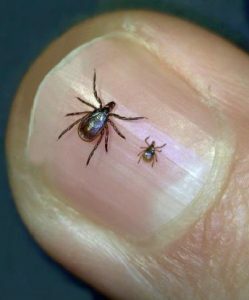 Remember that the deer tick (Ixodes scapularis) is the only tick that can transmit Lyme disease, but there are other species of ticks throughout the state. Tick identification references are available to order online at Maine CDC’s website. The University of Maine Cooperative Extension Tick ID Lab offers free identification services and educational resources. Maine CDC has Lyme disease information available on our website at http://www.maine.gov/lyme. Lyme disease data is available through the Maine Tracking Network at http://www.maine.gov/idepi, under Epidemiology Information on the left hand side of the page. 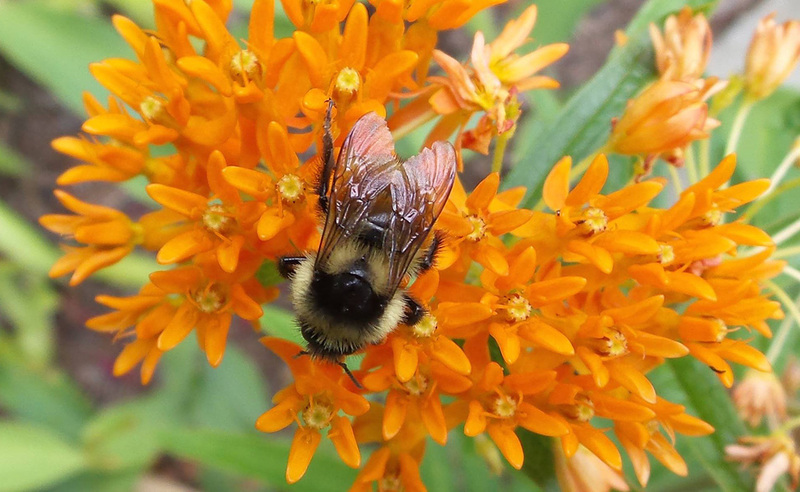 University of Maine Cooperative Extension Tick ID Lab submission instructions can be found at https://extension.umaine.edu/ipm/tickid/. To continue getting Lyme updates throughout May, please like the Maine CDC Facebook page at https://www.facebook.com/MaineCDC. Down East AIDS Network (D.E.A.N.) is a support organization for people living with H.I.V. or Hepatitis C. Its office is sequestered on a back street in Ellsworth, with minimal signage and a purposeful lack of visibility to protect the confidentiality and privacy of its clients. 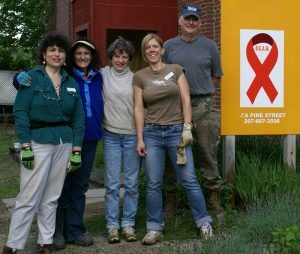 DEAN has a paid staff of three, and relies heavily on volunteers to achieve its mission. It provides education, individual counseling, support groups, home visits, and advocacy services for its clients. DEAN currently serves approximately 50 clients in Down East Maine. Roughly seventy percent are male. Its population is aging, as preventive education and pre-natal care for HIV positive mothers have curtailed the onset of HIV in younger adults and children. 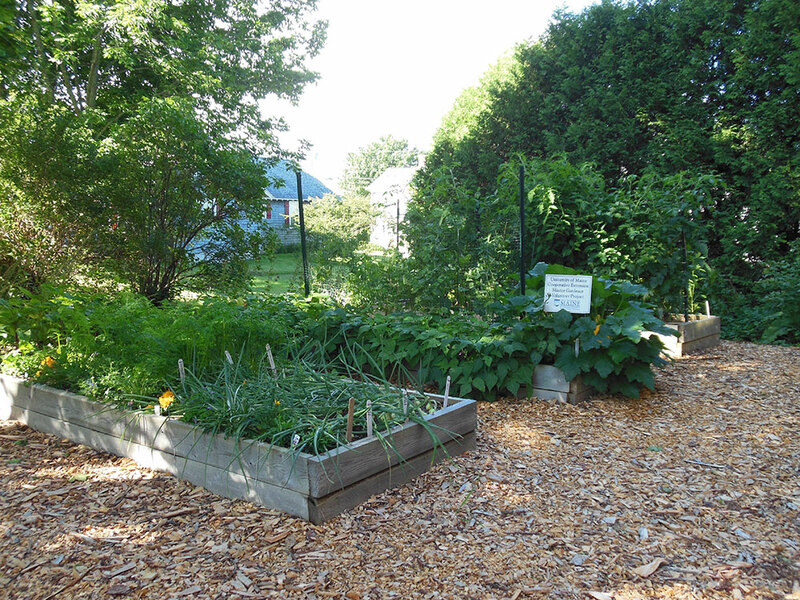 A member of DEAN’s Board of Directors approached Cooperative Extension in 2011 asking for guidance and assistance in building a raised bed vegetable garden on the gravel lot adjacent to their building. 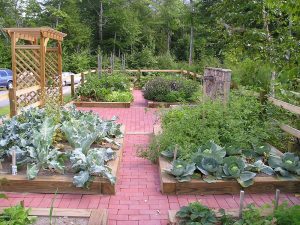 to enjoy the economic and health benefits of sharing in the garden’s harvest. We were told that we would initially face challenges in getting DEAN clients involved with the project. There is still a great deal of fear among clients due to discrimination and a lack of knowledge about HIV among the general population. Some clients are afraid to walk in the front door of the DEAN building for fear they might be seen. In the first year, Master Gardener Volunteers built three raised beds (4’ x 12’), spaced 5 feet apart for wheelchair accessibility. The soil, lumber, seeds, and transplants were all donated by community members. The only cost incurred was getting the soil tested and purchasing the necessary soil amendments. Master Gardener Volunteers by DEAN office. Photo by Marjorie Peronto. As predicted, the major challenge in this project has been gaining the trust of the clients so that they would feel comfortable being involved with the garden. For the first two years, MGVs worked primarily with the DEAN staff. 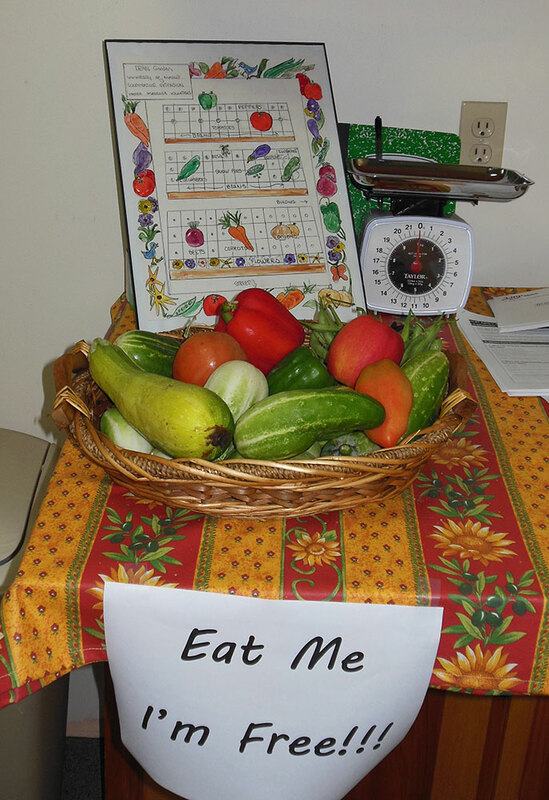 The staff surveyed the clients to find out their vegetable preferences. 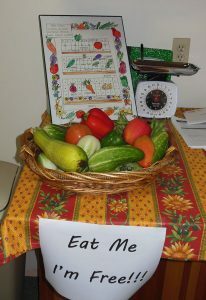 We grew, harvested and placed the fresh vegetables inside the building for clients to take home. DEAN Garden drawing. Photo by Marjorie Peronto. DEAN veggie display. Photo by Marjorie Peronto. It was the staff’s role to encourage the clients to help themselves, and to go outside and pick vegetables from the garden freely. The garden site however is in plain view, a deterrent to those who wish to maintain privacy. In 2014, (our fourth year) we were invited to meet with the DEAN Client Advisory Board (comprised of DEAN clients). Finally, we had an opportunity for personal exchange with the clients; a sign that we were gaining trust and acceptance. The Client Advisory Board was incredibly enthusiastic. They felt that the services provided in past summers had been well received by all clients. They asked us to expand the garden and wanted to be present to help plant the beds. They were very enthusiastic about being able to obtain seedlings that they could take home and plant. They felt that the need for education was very important, and asked for written instructional materials that clients could take home. We have seen good progress over the last four years. 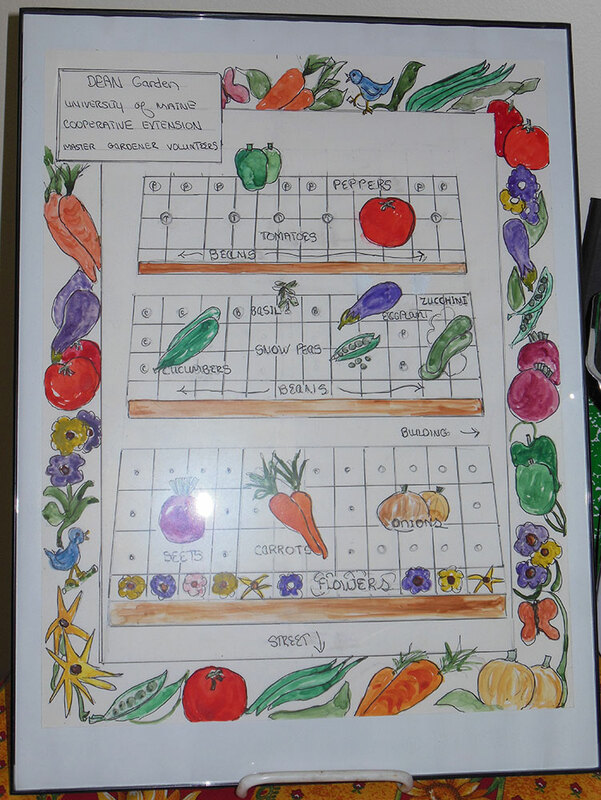 We are supporting the DEAN organization through providing a nutritional resource for clients; showing community support for the DEAN mission; and providing an opportunity for DEAN clients to grow their own vegetables. 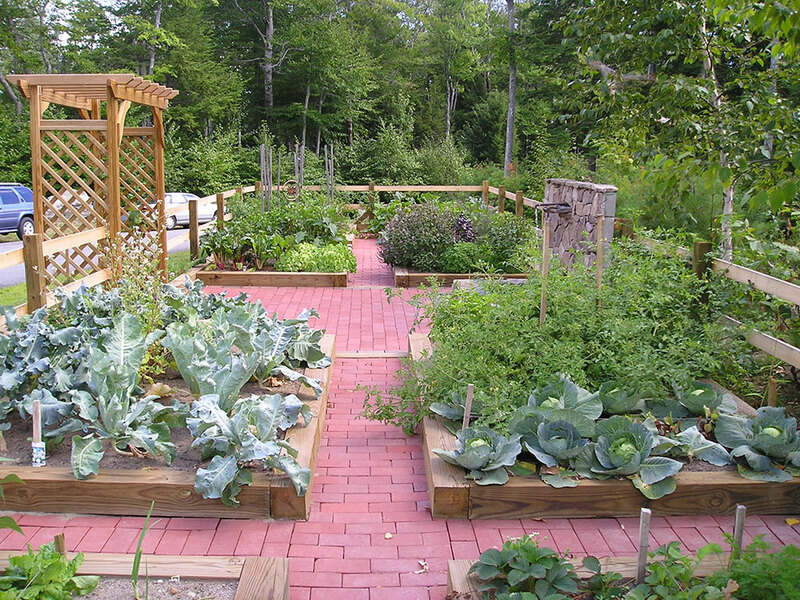 As we begin the 2015 season, the vegetable garden has been enlarged to five raised beds. DEAN has expanded the distribution of its produce to the local homeless shelter. We have made vegetable seedlings and educational materials available for DEAN clients to take home, encouraged their interest in home gardening and given them the ability to supply themselves with nutritional foods that they especially enjoy. If funding can be found, a privacy fence will be built around the DEAN garden. It is hoped that this will allow more opportunity for the clients to enjoy the serenity and therapy that working in a garden offers. Cilantro. Photo by Edwin remsberg. Eating what you have grown can be an exciting and liberating experience. Although, after some time, we tend to get into a rut preparing those delicious items we grew. As a dietician I am always looking for ways to keep my diet variable. One of my secrets to boosting kitchen creativity and eating the nutrients I crave is using fresh herbs. Fresh herbs can be grown indoors year round. By consuming fresh herbs you can get a power packed serving of vitamins, minerals, antioxidants, and phytochemicals in addition to what you’re already eating. 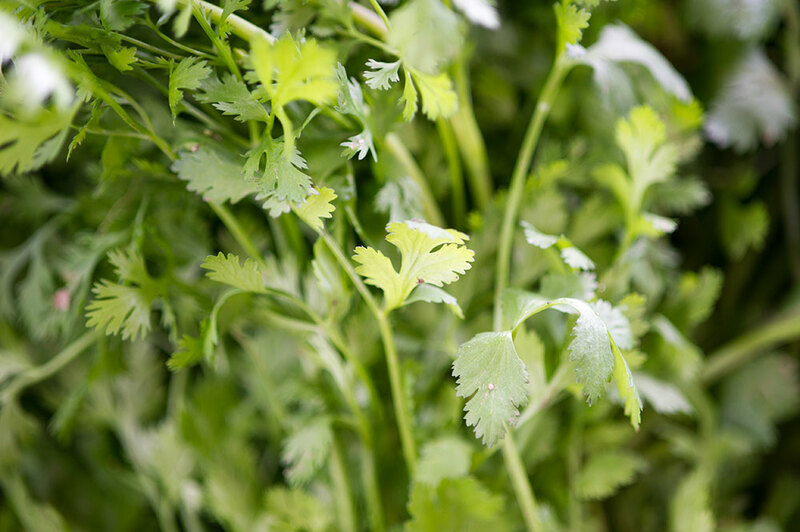 Fresh herbs are also a great way to add flavor while decreasing sodium intake. The commonly grown herbs like basil, oregano, and parsley are great to start with. But don’t forget about using herbs like sage, cilantro, rosemary, mint, and tarragon in your cooking. Sage has a sweet and savory flavor. It’s packed with vitamin K and phenolic acids. The flavor of sage goes great with egg dishes, nightshade vegetables, and poultry. Sage can happily be added to your marinades, salad dressings, and even as a pizza topping. You’re either a cilantro lover or a cilantro hater. If you haven’t tried it, I highly recommend giving this herb a try. Cilantro goes great with cool dishes like cucumber salads or salsas. It also turns your seasonal find at the fish market into something special for a weeknight palate adventure. Like sage, this herb is rich in antioxidants. It also has a wonderful mineral profile of potassium, calcium, magnesium, and iron. Out of all herbs, rosemary is my favorite. 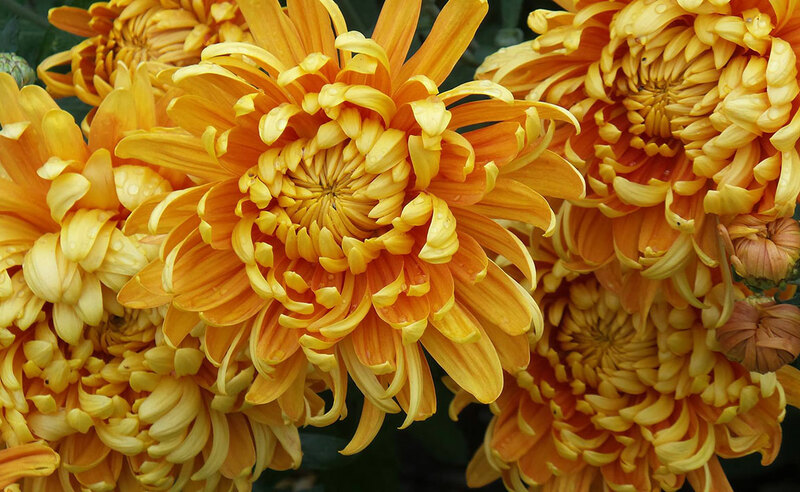 It has a floral smell and a texture that can hold up in marinades as well as roasts. Rosemary goes great with poultry, but can also add flavor to your favorite seasonal vegetables. The easiest way to use rosemary is to use whole sprigs in cooking or to pluck the herb completely off the woody stem. If you want to try something new, but feel weary about trying strong flavors, mint is for you. Mint can add flavor to your dressings, meats, salads, and even your water. Adding an herb like mint can take a salad from boring and monotonous to a culinary treat. Try adding mint to slices of watermelon or cantaloupe for a refreshing and healthy snack. Or get creative and add it into plain yogurt with grapefruit slices. Mint contains essential minerals and pairs nicely with fresh and nutritious foods. Tarragon is a sweet herb with deep flavors. Like rosemary, it can be used in whole sprigs or chopped. Tarragon goes great with poultry and fish. Putting tarragon in vinaigrette to dress your favorite greens will not disappoint. Making your own dressings is a great way to be creative in the kitchen, boost your nutrition, and save money. 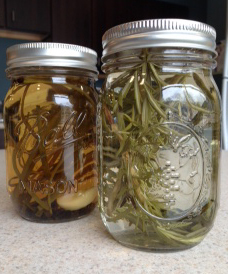 Try some of UMaine Extension’s favorite herbal vinegars like fresh tarragon vinegar. Experimenting with new herbs in the kitchen makes eating your fresh and nutritious food exciting. When roasting root vegetables, I recommend brushing them with olive oil and fresh herbs. Or as an option, you can add herbs to your favorite cool salads and salsas. Herbs can transform flavor and boost nutritional profile of any sauces, dresses, dips, or marinades. Growing and cooking with fresh herbs is an inexpensive and nutritious addition to your diet.